Age 91, of Bolivar, OH. passed away Sunday, April 14, 2019 in Aultman Compassionate Care Center following a brief illness. 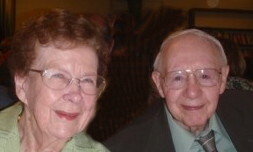 Born June 11, 1927 in Canton, Ohio to the late Harry and Elizabeth (Myers) Bechtel. She was a Bolivar resident for the past 10 years prior to which she resided in the Canton South area. She was a graduate of Ashland University. Donna retired from Canton City Schools where she taught for 40 years. She was a member of Trinity Brethren Church where she was a deaconess, served as president of WMS Society, and had been a long time Sunday School teacher. She was also a member of Pike Grange. Preceded in death by her husband, David E. Barnes in 2018; two sisters, Arlene Heist and Thelma Watkins. She is survived by a son and daughter-in-law, Dennis and Susan Barnes; a daughter and son-in-law, Debra and Mark Lovetro; four grandchildren, Ben Lovetro (Matt Pekala), Kimberly (Alex) Hall, Joshua (Miranda) Barnes, Katelyn (Christopher) Foltz. Funeral services will be Thursday, April 18, 2019 at 10:00 am in the Kreighbaum-Sanders Funeral Home on South Cleveland Ave with Pastor Ralph Gibson officiating. Interment in North Lawn Cemetery. Friends may call Wednesday from 5 – 8 pm. Memorial donations may be made to Trinity Brethren Church.